Many people dream of a whiter and more attractive smile, but they have chipped, stained, discolored, crooked, or unevenly spaced front teeth. If this describes your situation, we would be happy to help you. With porcelain veneers, Dr. Boehmer can erase common flaws like stains, chips, and gaps so you can finally enjoy a sensational smile. Made from durable porcelain, veneers look sensational and can withstand the stresses of daily life. 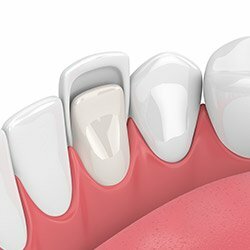 Why Choose Us for Porcelain Veneers? To guarantee the best results, Dr. Boehmer will show you examples of veneer styles to see what you like. She will then evaluate your teeth and features to select the porcelain veneers that will enhance your overall appearance and complement your personality. The actual cosmetic dental treatment usually takes only two appointments, as well as one or more pre-operative visits to work out the details of your situation. There is often a follow-up visit or two as well for final adjustments and polishing. With proper care, your new smile can last for years to come. If you are ready to experience dentistry tailored to your needs, call our Albuquerque dental office and schedule an appointment with Dr. Boehmer. Our relaxing, Northeast Heights Albuquerque office is easy to access. Stop in and see how our personalized dental services can transform your smile.